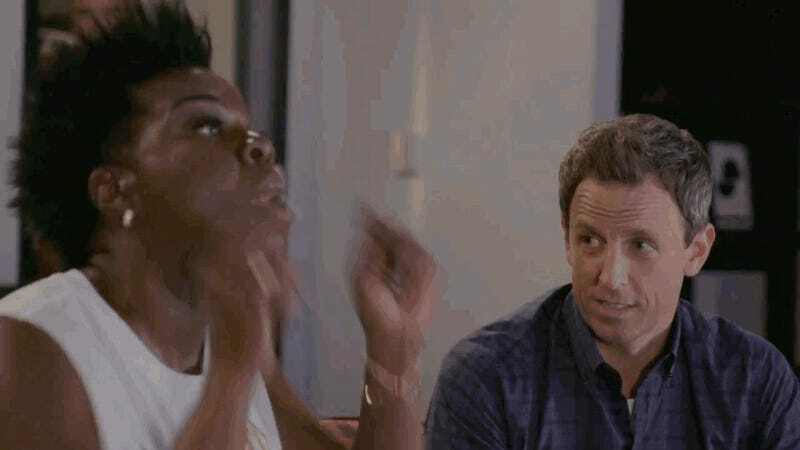 Leslie Jones has returned to Late Night with Seth Meyers to recap the latest episode of Game of Thrones. While this is only the second time she’s done it, it’s got to be one of the greatest recaps in the history of Westeros. By the Seven, Meyers needs to make this a weekly thing. If not, someone else will. Last year, Jones joined Meyers to chat about “Battle of the Bastards,” leaving audiences eager for more of Jones’ pitch-perfect analysis. Well, it’s more like her signature riffing mixed in with some serious fandom, but it was exactly what was needed after such a dark and intense episode. For the latest episode, “The Spoils of War,” Jones has come back to dish about how she’d sleep with Littlefinger, why the Starks’ reunion needs more macaroni, and lots of freaking out about dragons. And look, Varys (Conleth Hill) even showed up, bald cap and all! Jones tried to get him to spill the beans about his true allegiances, but he’s not talking. However, he did throw in a bit about how he was the one who actually saved Jaime Lannister from the dragon fire (not really). Jones already does some great live-tweeting during each episode, which I consider required reading for just about any Game of Thrones viewer, but there is so much more she could be bringing to fans. We’ve got at least a year before the eighth and final season, plenty of time to make Game of Jones happen. And it better happen. I need more of this in my life. "Here Come The Dragon! Here Come The Dragon!"